All content included on this site such as text, graphics and images is protected by U.S and international copyright law. The compilation of all content on this site is the exclusive property of the site copyright holder. 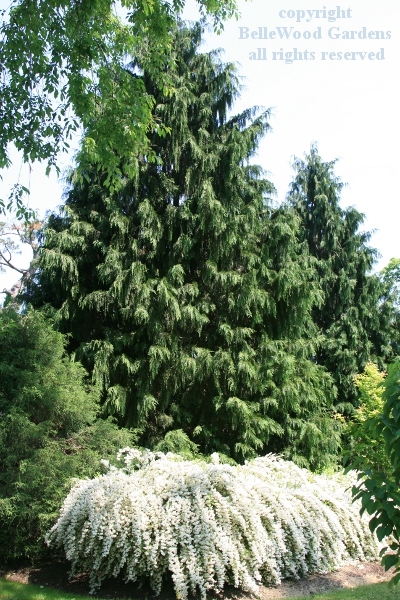 Just because I made a garden visit to the Morris Arboretum on Wednesday is no reason to stay home today. 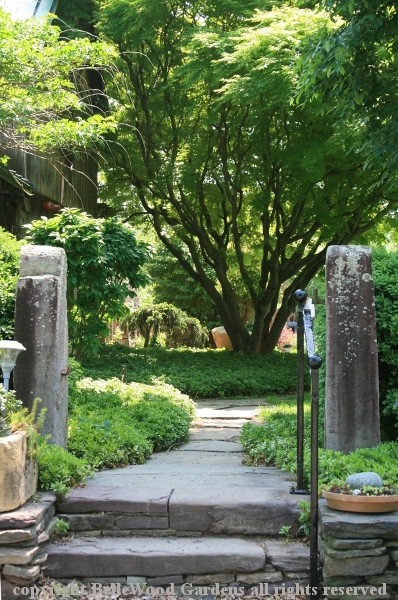 It's the Garden Conservancy's Open Days in Pennsylvania. Three gardens. One, a new one to their repertoire, is only open today. Another has been mentioned quite favorably by a friend. And fortunately I've visited the third garden several times - fortunate because the two gardens will be enough. My friend Joan and I plan our outing. We will first visit the garden furthest away from her house. Then lunch, after which onward to the somewhat closer to home second garden. Weather is rather warm and somewhat humid. No matter, it's not raining. Fortunate man, Ridge Goodwin. His vocation and avocation dovetail quite nicely. 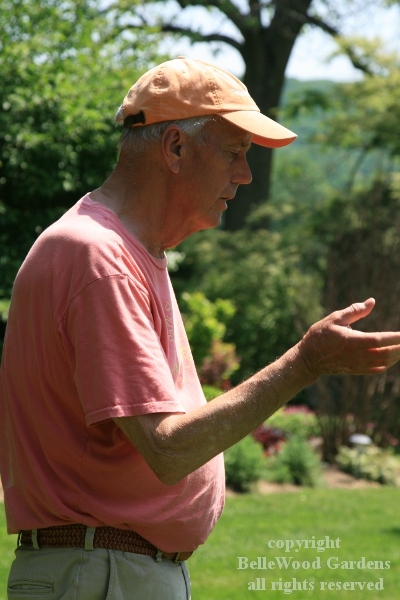 He is a nursery stock broker who, in his own words, "In calling on the trade I was exposed to a wide variety of unusual trees and shrubs and fell easily into the habit of collecting them." Plants need somewhere to grow. This property was acquired forty years ago. And the garden just grew larger, expanded, keeps growing. If someone else has the typical upright form, Ridge has the weeping variant. They have green, he has variegated. 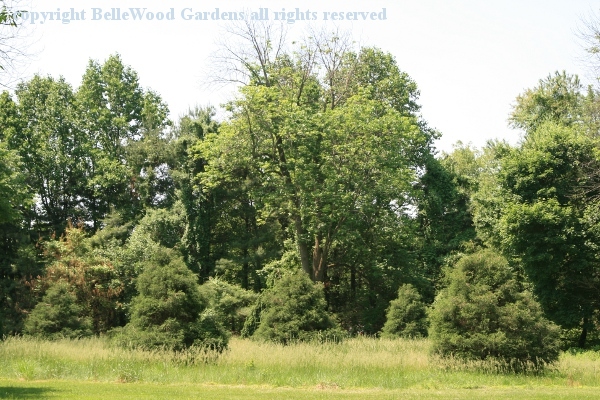 The garden leisurely sprawls, with graciously wide grassy paths that wind around plantings. Trees conceal one path from another, so new discoveries await at every turn. One of the beginnings, which Joan and I found as we were leaving. Plants are not merely plopped into place and left to do their own thing. They are paired and partnered so the combinations look even better than they would if grown individually. 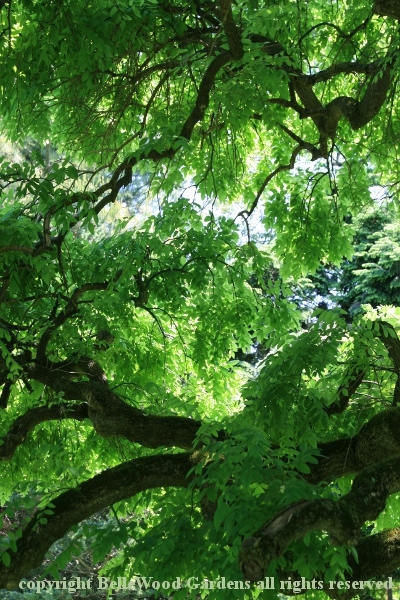 to reveal its sinuous, pendulous, branching habit. Right now, it is the flowers that capture our attention. 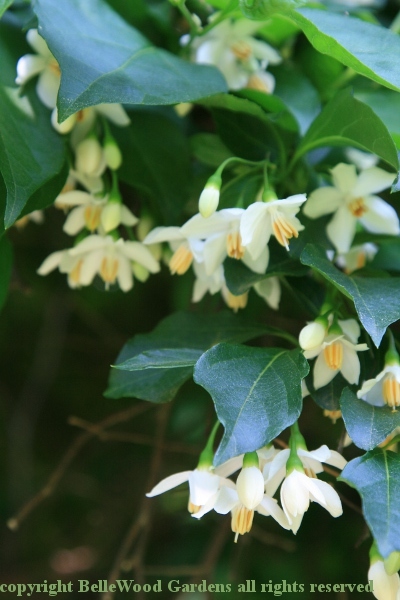 Easy to see how silverbell became its common name. A family of gnomes. Not really, just more recently added conifers. Ridge Goodwin, Haystacks at Gardens at Half Moon. 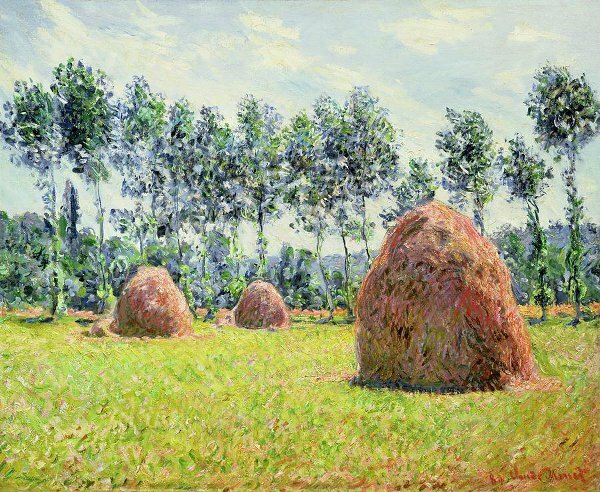 Conifers planted in homage to Monet's painting. 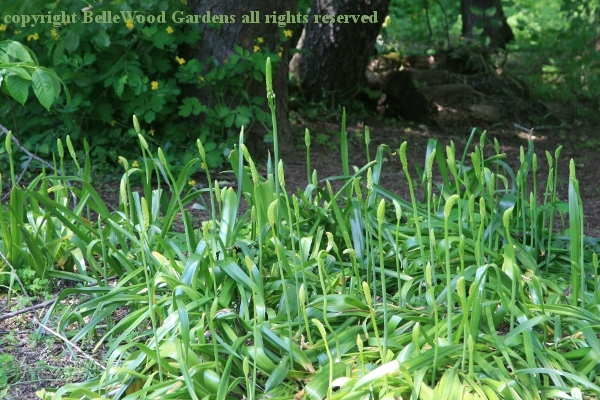 two large colonies of a bulb. What might it be? No idea. Ridge didn't know. 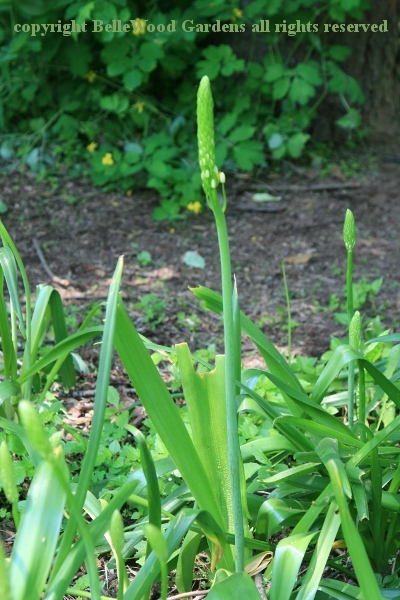 with consensus, named it as Ornithogalum magnum. 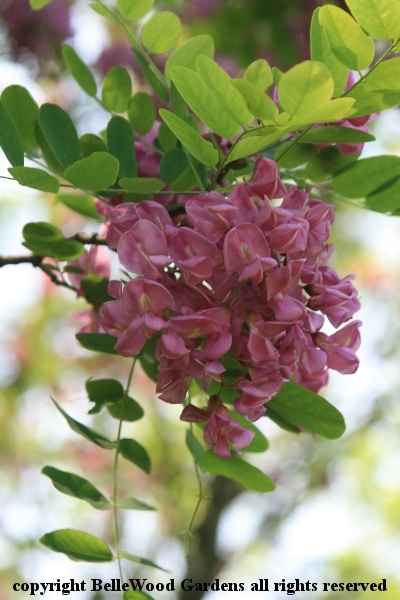 One tree Ridge told us to look for is Robinia 'Purple Robe'. He spoke well of the flowers, not so of the tree. Locust, as you probably know, have white flowers. 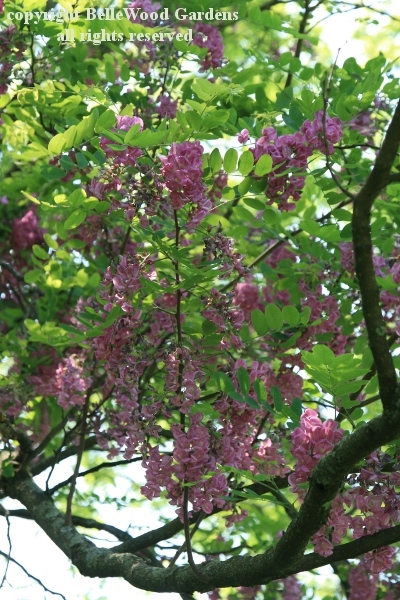 This cultivar has royal purple ones. But the tree itself is somewhat straggly / scraggly. Which explains its not-very-prominent location. 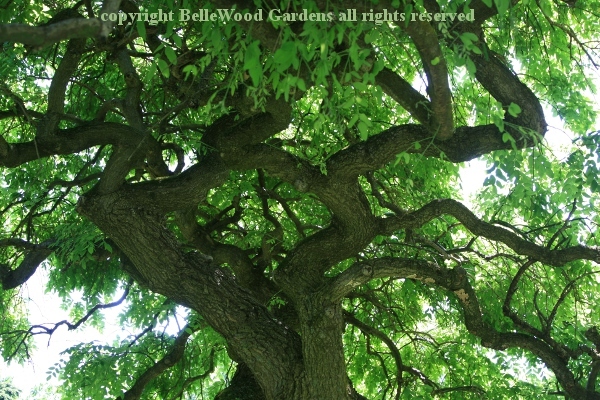 Reminiscent of a wisteria, don't you agree? Then there was a mystery tree. I didn't know, Joan neither, or another garden visitor. Given its prominent location in an island bed, underplanted with Japanese forest grass, Hakonechloa macra 'Aureola' it was something special. But what? 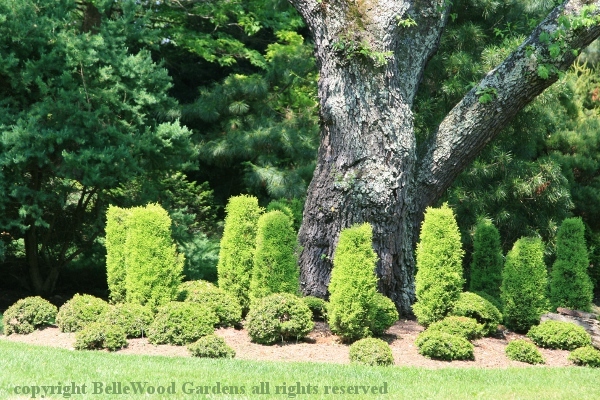 It is another of the weeping form cultivars Ridge displays in the Gardens at Half Moon, pruned to display its structure. 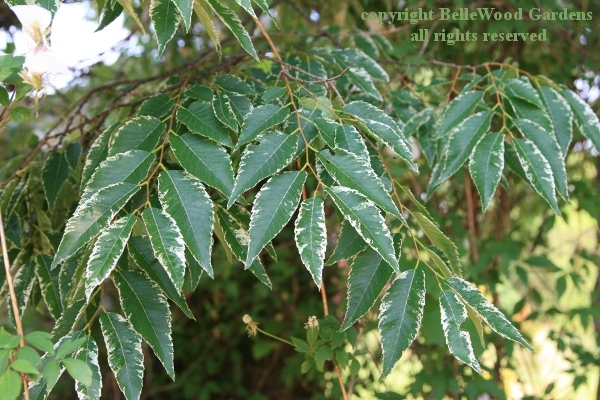 It is Sophora japonica 'Pendula'. So beautiful. 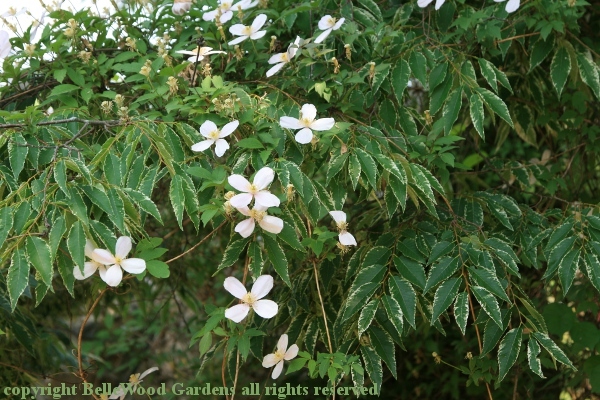 Delicate pinnately compound foliage in sunlight, as pretty as flowers. Now it is after noon, and we're heading back to the car. But keep detouring, zig-zagging as something and another thing catches our attention. 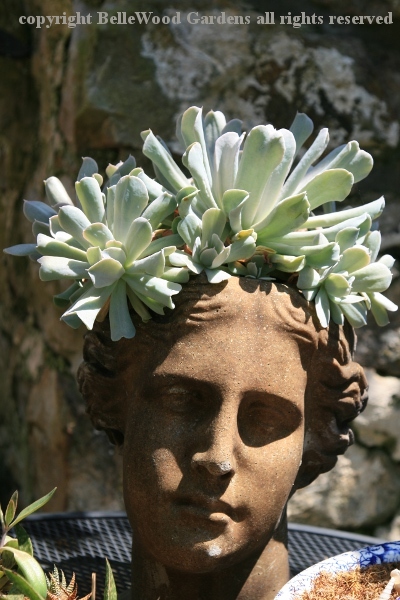 Like this planter, a woman's head, Medusa with succulents. Further into the courtyard, peeping over a wall . . . what could this possible be? Be still my heart. 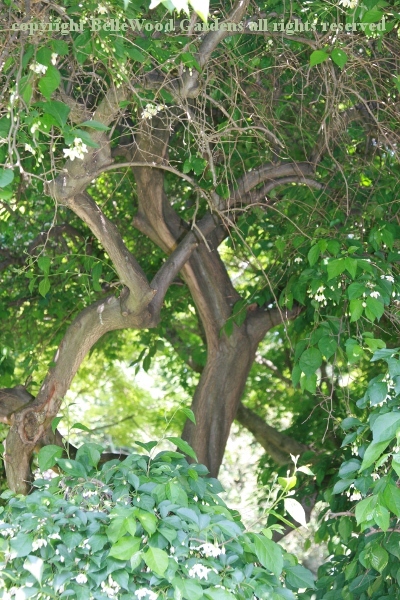 It is a clematis weaving through a tree. But what tree? 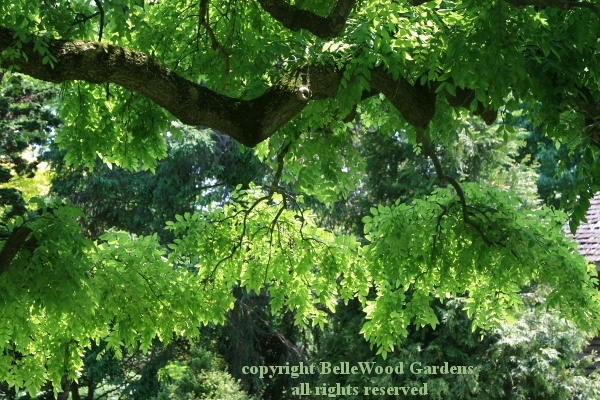 Looks like, yes, it is a zelkova. 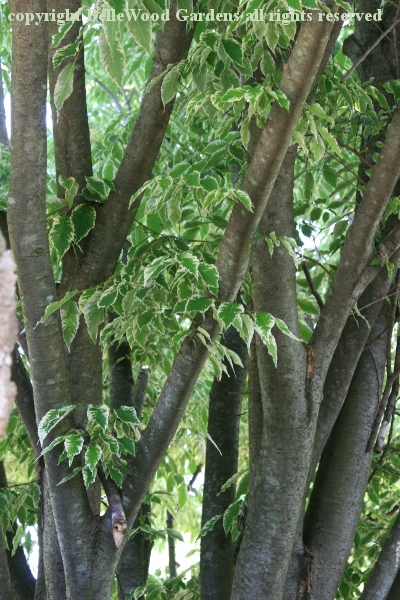 A variegated zelkova. Delicately variegated. from Japan. Some absolute thugs too, they like our growing conditions. This, however, would be welcome in any garden. As Joan and I wandered, bemused, through the Gardens at Half Moon, Ridge also spent the time walking through the gardens. He answered questions, identified plants, and also, I think, enjoyed the enjoyment of the Open Days visitors to the garden. Thank you.